The 2018 Mercedes-Benz X-Class pickup truck has finally, for real, landed in its final form at a blowout shindig in Cape Town, South Africa. Today, the world meets the mid-sized Mercedes luxury truck it’s been waiting for, I guess. Before anybody reading this in America gets too excited, the X-Class is only coming out in Germany and other parts of Europe this year. Next year it will come to South Africa and Australia, and by 2019 the truck is supposed to be on sale in Argentina and Brazil, too. Sadly, like the Nissan Navara and Renault Alaskan with which the X-Class shares a platform, there are no official plans for an incursion to the U.S. market. Interestingly, the truck is not commercially-oriented and basic like some of the “utes” and heavy haulers Mercedes already sells in strong numbers abroad. The X-Class will tack toward luxury, actually making it more consistent with the brand’s vibe here in America despite the fact that it will probably never be sold stateside. Where the X-Class will be available, it’ll start at €37,294 in Germany ($42,770 at current exchange rates, again, not that it matters) and come in three trim levels with four engine options, rear-wheel drive or selectable four-wheel drive, and a seven-speed automatic or six-speed manual. The truck will use Mercedes’ 4MATIC system to drive all its wheels, which will have a low-range in the X-Class. The smallest engine will be a four-cylinder gas in the X 200 model with 164 horsepower and 176 lb-ft of torque. The remaining powerplants are diesel, including an X 220 d rated at 161 HP/297 lb-ft and an X 250 d rated at 188 HP/332 lb-ft. The range-topper will be a six-cylinder diesel called the X 350 d rated at 255 HP and 405 lb-ft of torque. 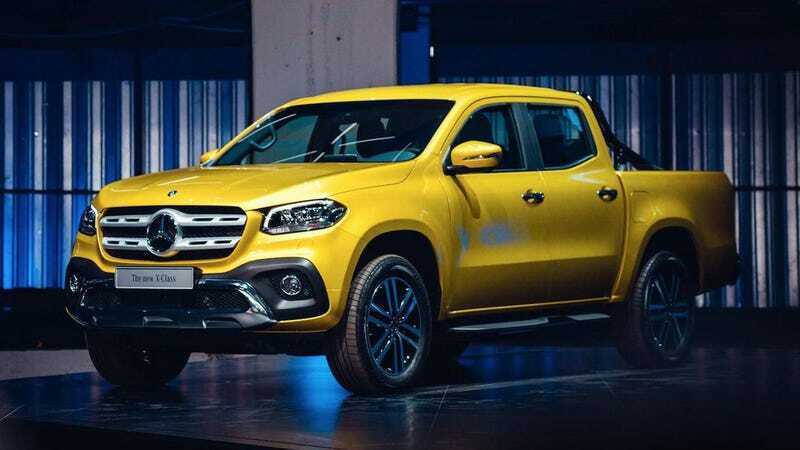 That will power the highest-capacity X-Class, which Mercedes claims will be capable of carrying 1.1 tons of payload or tow 3.5 tons on a hitch. The truck bowed in the same white and baby-barf green paint jobs we saw it in as a concept a few months ago, but the air scoops have been subdued and the snout looks a little more tame. As for earnest off-road abilities, that winch-wielding big-rubber’d monster from the concept show was noticeably absent. Though of course Mercedes claims the X-Class is “excellent off-road...” with “superb on-road performance” in its press release. The company is also promising a big range of accessories for “styling, loading solutions and off-road. It will be expanded successively, especially for off-road use.” So perhaps we’ll see more aggressive order-from-the-dealer adventure setups on this thing eventually. I actually really like the way it came out, and I’m bummed we won’t see these on American streets. Maybe I’ll ask about getting diplomatic license plates at my Global Entry interview. Update 2:13 p.m. est: the starting price was changed from €37,000 as was said in the presentation to €37,294 as was published in the press release afterwards.